Planning a wedding, family reunion, birthday party, retirement celebration, meeting, or group gathering? The Palatine Park District has the perfect venue for your next event. Whether you’re looking for an intimate setting at our golf course clubhouse, an outdoor shelter with considerable open space, or a performance space with an auditorium capacity for 400+ guests, our parks and facilities have just what you are looking for! Party packages are available at Birchwood Recreation Center, Community Center, Falcon Park Recreation Center, Palatine Hills Golf Course, and Palatine Stables. 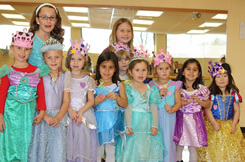 Packages include two-hour facility rental, themed activities and materials, and an instructor for the first hour. 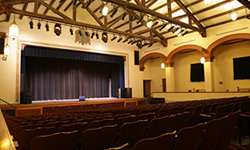 The historic Cutting Hall Performing Arts Center, located at 150 E. Wood Street, seats 431 and is an ideal venue for a theatrical production, concert, cultural event, seminar, business meeting, graduation, or wedding. Featuring a theatre sized projection screen along with state-of-the art lighting, acoustics and sound technology, Cutting Hall is capable of facilitating a full range of performances and events. Falcon Park Recreation Center, located at 2195 N. Hicks Road, is a unique venue for athletic events, celebrations, business meetings, and special events. The banquet room can seat up to 120 people or can be divided into two smaller rooms, creating the perfectly-sized room to suit your event. 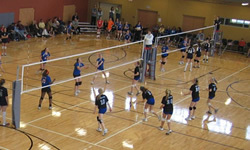 The gymnasium offers a space for up to 300 people. 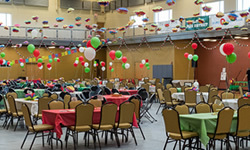 The facility offers bar packages, AV set-up options, warming kitchen, 60″ round tables, six and eight foot rectangular tables, and banquet and folding chairs. 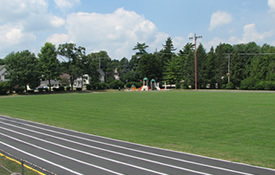 Natural grass softball and soccer fields are located throughout the District. The District also has two outdoor synthetic turf fields at Celtic Park. There is a 2 hour minimum for all rentals. Meeting room and gym rentals are available at the Birchwood Recreation Center, Community Center, and Falcon Park Recreation Center. Additionally, these facilities have multiple meeting rooms with capacities from 20 to 80 people. All meeting rooms have televisions capable of connecting to DVD, Blu-ray, and computers for presentations. 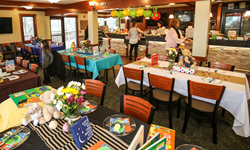 The newly renovated clubhouse at Palatine Hills Golf Course, located at 512 W. Northwest Highway, offers a scenic location with indoor seating for over 75 people, a private room that can accommodate 24 people, an outdoor deck with sound system, a newly redesigned bar and restaurant area, newly remodeled bathrooms, and six televisions with media connections for presentations. Palatine has a variety of beautiful parks to choose from for your next event. Picnic shelter rentals include the use of the shelter, tables and grill. 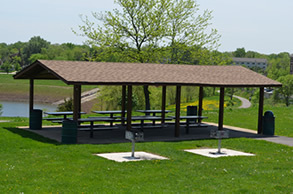 All shelters are located near open space that can be used for your picnic activities. 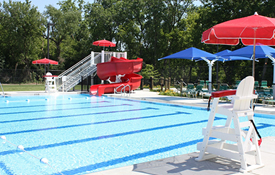 The Park District pools are available for private rentals after regular pool times. Picnic areas are also available for rent during open hours at the Family Aquatic Center.